The Weekly Weather: As mentioned before, it was so pretty this past week! It’s been warm (but not too warm), sunny, and breezy. I hope it lasts a bit longer before summer hits! What Paul’s Been Up To: Aside from school and work (he got stuck at work on Friday for an extra couple of hours because he had to help fix a huge computer problem with the library), he spent a lot of time on Saturday making our yard pretty. He transplanted our tomato seedlings (they looked a little shocked with the transplant, so we’re hoping they will make it, but if they don’t, I will probably go to Lowe’s to get replacement ones tomorrow). He also put down fresh cardboard, newspaper, and mulch in the garden bed (to help keep away weeds), and mowed both yards. I know it was a lot of hard work, but it pays off because the yards look great! What Sarah’s Been Up To: I have been plugging away at teaching piano (I had one student drop, but another started up), working on my visiting teaching stuff, and getting my choir prepared for the Easter fireside our stake is putting on tonight (our choir is singing a piece). There will be musical contributions from each ward in the stake, a combined Primary choir piece, and a combined stake choir piece at the end. I think it’s going to be beautiful! I will also be glad when it’s over because I get very nervous leading in front of big groups. 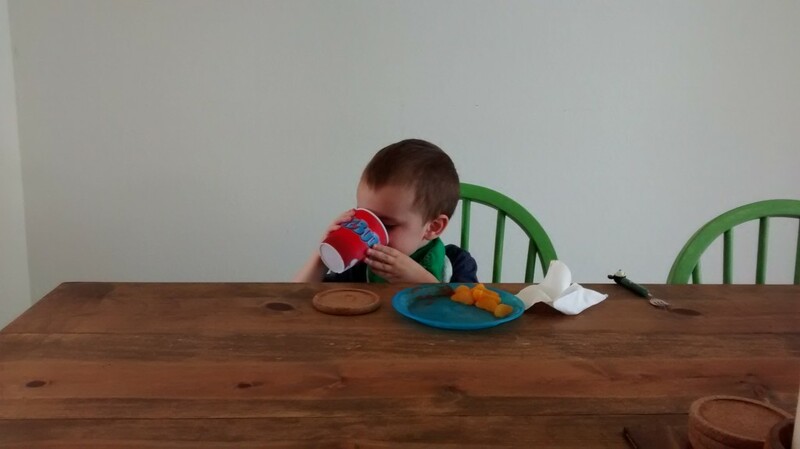 Another experiment: doing away with his straw cups. 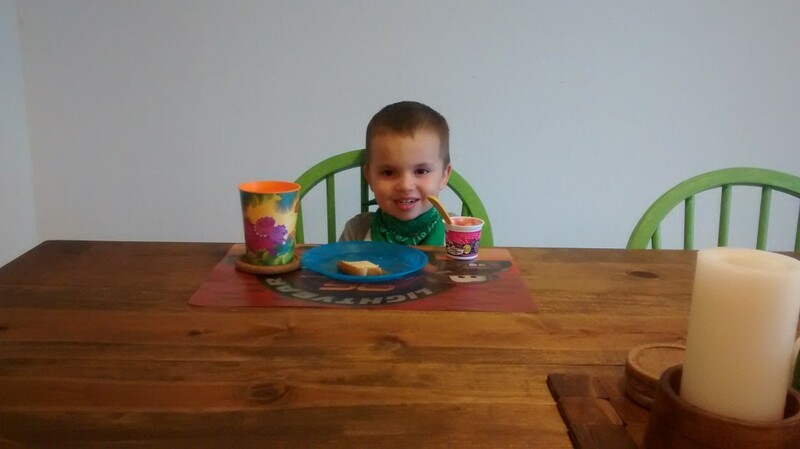 He seems to be handling the open cups pretty well. He especially likes his 3D HEB cup. He saved up a lot of his points from the Buddy Bucks machine in order to get it. Pre-haircut. 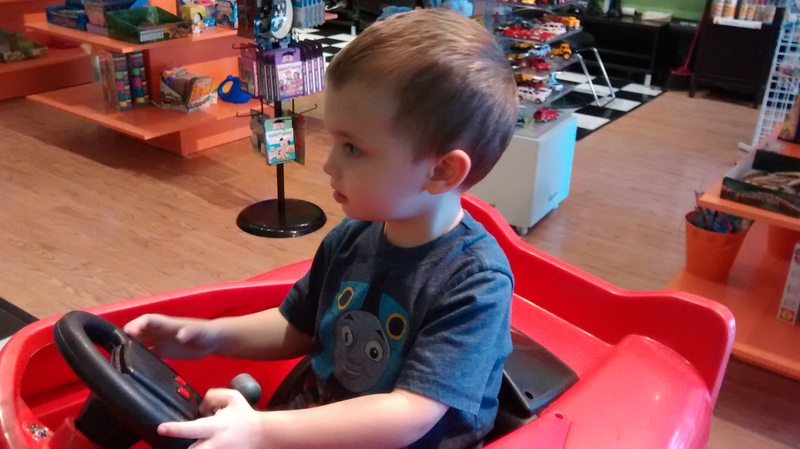 He was excited to be able to sit in a Lightning McQueen car chair. 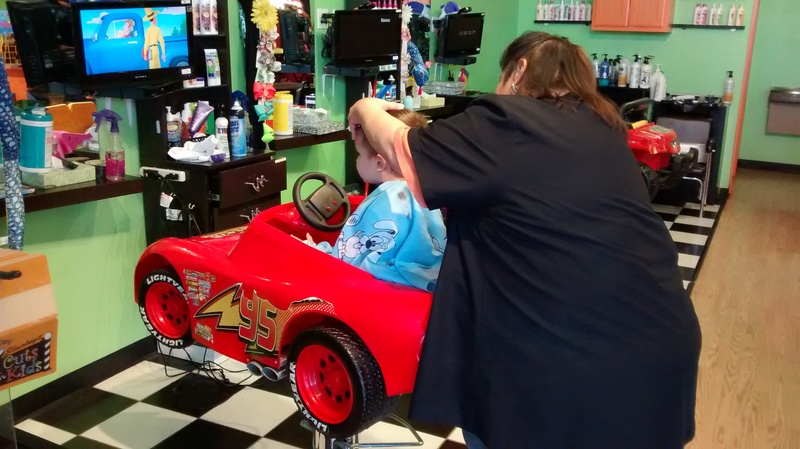 During the haircut. He really liked that they had Curious George on (they have a Roku Box, so they can choose from a bunch of different shows). 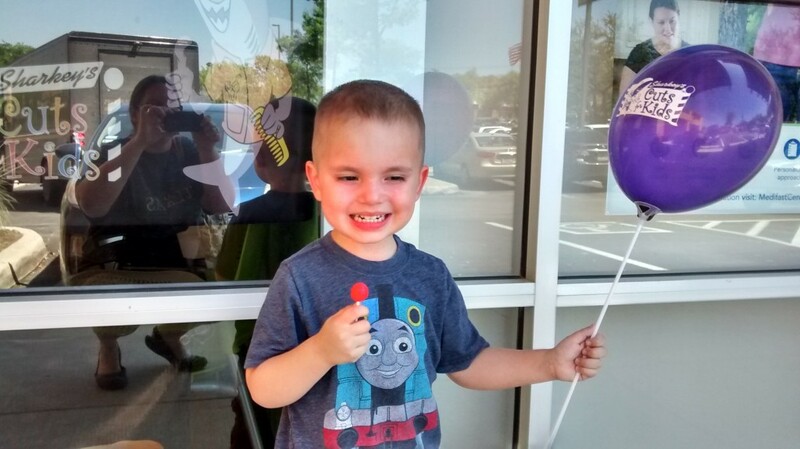 Post-haircut: he really liked that he got a Dum-Dum sucker and a balloon at the end. 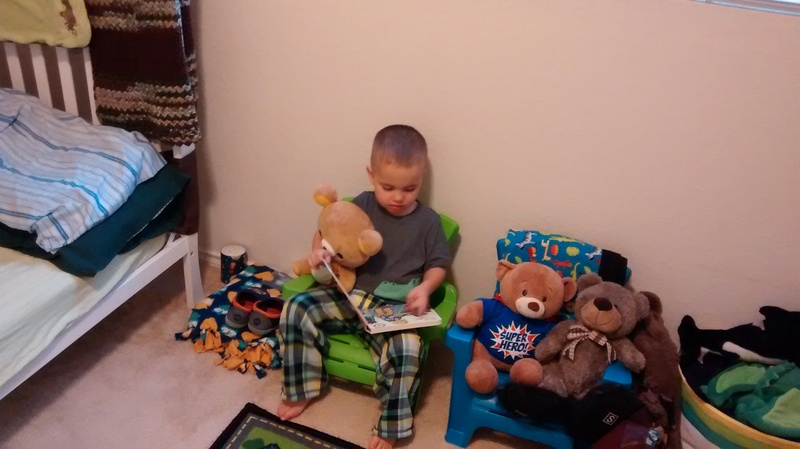 He told me he was reading his bear a daytime story. 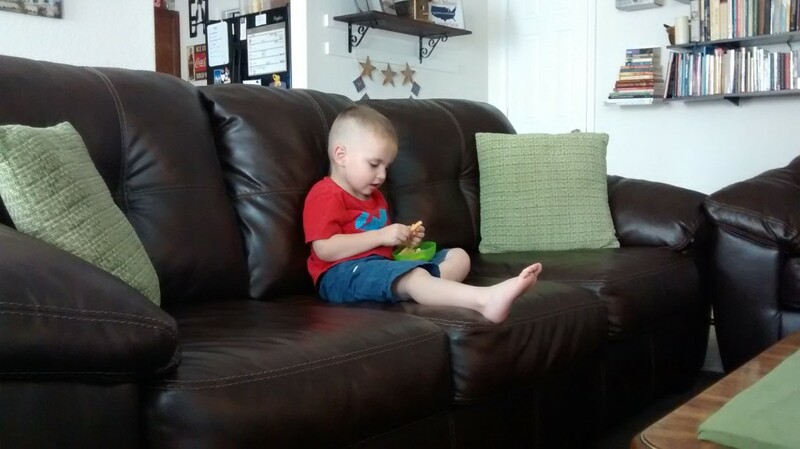 Eating Veggie Straws (a new favorite snack) and singing along to a song on the TV.